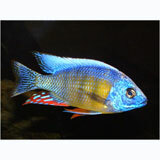 Peaceful, lively cichlid that can be kept together with other peaceful cichlids from Lake Malawi. The aquarium should be set up on the sides and background with a lot of rocks that form caves and crevices. You should leave enough free swimming space. A territory is made. The substrate should be sandy. Some low, hard plants can be used for decoration. You should keep one male together with several females. You should give small, live food. Frozen ans dry food are accepted as well. Breeding is rather easy. Up to 50 eggs are laid and fertilized. Immediately after that the female takes the eggs in her mouth. After 3 week the young fishes leave the mouth of the mother for the first time. You can raise the young fishes with baby brine shrimp and fine crushed dry food. This describes the overall demeanor of a cichlid toward other tank-mates of the same species. Consider that there is variability in temperament due to such factors as aquarium size, stocking levels and order of introduction. There may even be some variability among individual specimens.